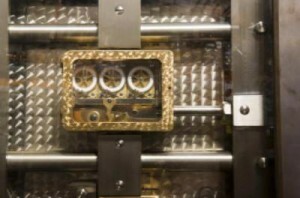 Everyone knows about Fort Knox, the U.S.’s ultimate gold vault. But besides that one little fact, how much do you really know about the place that supposedly holds up to 5% of the world’s mined gold supply? It’s not actually called Fort Knox. Officially, it’s called the United States Bullion Depository. People refer to the depository as Fort Knox only because it sits within the borders of a S. army base called Fort Knox. It’s in Kentucky. That’s right, Kentucky. Fort Knox and the depository are actually located just south of Louisville, Kentucky. The money’s underground. The big shell of a building that is the Bullion Depository doesn’t actually hold the gold – it’s all underground in a vault lined with copious amounts of granite mined from the state of North Carolina. No one’s been inside in a while. Besides the few employees and guards of the depository, no one has entered the walls of Fort Knox since the early 70’s. That’s when a public outcry that the vault was actually empty prompted a one-time tour of the facility by select members of the U.S. Congress and the media. Apparently, there was still gold inside. No gold in, no gold out. The S. Mint states that the amount of gold at the mint remains the same. Only small amounts of gold are removed from time to time for audits. Otherwise, the amount of gold remains at 147.3 million ounces. While there’s still some skepticism from the public about how much gold is actually in the vault, the good news is that you don’t have to rely on the government to store wealth on your behalf. Continue learning about your precious metal storage options.